Filipino-American netter Treat Huey hopes to improve his doubles rankings when he teams up with Belarusian Max Mirnyi in the US-M Shanghai Rolex Masters which kicked off on Monday at the Qizhong Tennis Center in China. Mirnyi, who won the doubles title in 2011 with Canadian Daniel Nestor, is ranked No. 22 in the ITF doubles rankings. The seventh-seeded pair of Huey and Mirnyi got a first-round bye and will play against the winners between Chinese wild cards Gong Mao-Xin and Zhang Ze, and Americans John Isner and Jack Sock. British Jamie Murray and Brazilian Bruno Soares are the top seeds in the Shanghai Masters, which is of only nine ATP Masters 1000 tournaments in the world and the culmination event of the Asian swing. The other seeds are No. 2 Bob Bryan and Mike Bryan of the United States, No. 3 Marcelo Melo of Brazil and Lukasz Kubot of Poland, No. 4 Feliciano Lopez and Marc Lopez of Spain, Raven Klaasen of South Africa and Rajeev Ram of the United States, No. 6 Rohan Bopanna of India and Daniel Nestor of Canada and No. 8 Robert Lindstedt of Sweden and Vasek Pospisil of Canada. In 2013, Huey and British Dominic Inglot reached the quarterfinals but lost to brothers Bob and Mike Bryan, 5-7, 6-7 (4). 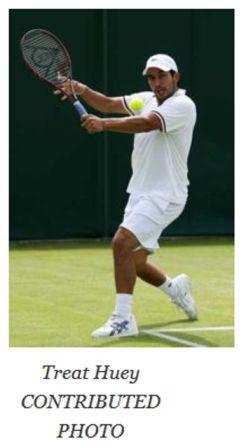 In 2012, Huey and partner Jonathan Marray of Great Britain absorbed a 6-7(9), 4-6 defeat from Indians Mahesh Bhupathi and Rohan Bopannain the round-of-16. The Shanghai Rolex Masters is one of the world’s biggest tennis tournaments and the only such tournament to be staged outside North America and Europe. Besides cash prizes, the winners will receive trophies designed and created by world famous Royal Selangor Pewter.